Palapa Thatch Umbrellas are a traditional grass umbrella originated from Mexico called "rain cape" using real palm leaf materials. 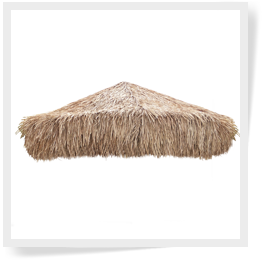 We offer treated palapa umbrella top covers with class A fire retardant for customers that are installing at a business location or that live in a HOA community whether using the thatch rolls inside or outside that will require a fire marshal inspections. Fire retardant is also great for customers that have a palapa structure that is close to a house, BBQ grill underneath their structure, wood burning fire pit or forth of July type holidays. We also offer a thatch sealer that can add up to 2 years of life expectancy when installing tiki thatch on a open air roof. We will add these products to the material prior to shipping to you, please choose one or the other on the drop down menu, you can not combine the two chemicals together. This process takes about 3-4 additional business days to ship, keep this in mind when ordering. Replacement Palapa covers are plants used in the production of many unique materials all over the world, including umbrellas, tiki bars and tiki huts. The art of harvesting this plant and dried palm leaves for use in everyday life has been popular in Asian countries for centuries. Because of their tropical, natural-looking style, bamboo and Palapa umbrellas are perfect for creating your backyard oasis to share with friends and family. When you imagine a luxury vacation, you probably picture yourself on a beach with a tropical drink in hand lying in a shaded area or at a beach bar. You can easily recreate this relaxing vacation sensation every day without ever leaving the comfort of your own home. Bamboo umbrellas are often also referred to as thatch umbrellas, tiki umbrellas, and grass umbrellas. Palapa breaths through its thatch, allowing you to combat the summer heat by keeping the underside 10 degrees cooler than the regular temperature outside. The natural materials of wood in both Palapa and bamboo umbrellas can complement and tie together any existing design. Awnings and other structures built for backyard pleasure can end up costing you thousands of dollars and still not provide the organic shade and luxurious resort styles of Palapa and bamboo. There are many options for purchasing Palapa and bamboo umbrellas online. If you’re interested in converting your backyard into an entire vacation retreat, you can save money by buying in bulk and enjoying cheaper wholesale prices. You can also find these products with expedited delivery and free shipping to start reveling in your tropical experience with little wait time. Commercial grade umbrellas are popular in many zoos, theme parks, dining establishments, and resorts all over the world. You probably have noticed the luxurious structures that ultimately enhanced your vacation experience and increased your desire to return. Palapa and bamboo umbrellas are both multi-purpose products that can be used throughout the home, inside and out. They can take the form of many different shapes, sizes, and styles with an array of options available on the market. These umbrellas can be placed into and bonded with virtually any material including grass, wood, cement, and even pools. Lawn Areas: Bamboo and Palapa umbrellas can be strategically placed in any lawn area of your yard. Typically, they are locked into a hole in the ground and filled with cement to keep them in place. Patio Areas: Installing these umbrellas within decks and patios are easy and only require a small hole and placement with cement. Indoors: You can also bring these organic structures inside your home without worrying about the typical mess or maintenance you would have with other natural wooden products and plants. Bamboo has become a green alternative to many other raw materials in the marking of products in almost every industry. This is due to the fact that bamboo is organic, eco-friendly, and can virtually eliminate the need for deforestation. Traditional hardwoods cause numerous problems that would take earth decades to reverse. The accumulating use of these timbers are harmful to the environment the more they are cut, processed, and used. So, what makes bamboo such a good friend to the environment? ● Bamboo only takes 3-5 years to reach its maturity level compared to the 30-50 years of other popular timbers. ● Trees are known for their ability to produce oxygen, making them a necessity for human life. Within every square footage of bamboo, more oxygen is produced than many other varieties of trees. ● When bamboo decomposes, it forms a 100% all-natural soil that is renewable, reusable, and high in essential nutrients. ● Bamboo can still flourish in harsh weather and many other bad environmental conditions that couldn’t house other plants and trees. Why Use Palapa and Bamboo Umbrellas? Palapa and bamboo umbrellas can add a number of benefits to your backyard. Along with its style, the umbrella is low maintenance and made from 100% natural materials. If you’ve already started designing the space that the umbrellas will be incorporated into, the style of the umbrella can be vital. Styles differ by region and are categorized as such. Tahitian Style - The Tahitian style features a round umbrella with a steel frame covered entirely of thatch panels from Tahiti. This umbrella has a shaggy look that creates the stimulation of being in a real forest. African Style - African style Palapa are made from materials mostly exclusive to the African region. This umbrella has a refined look suitable for modern and contemporary designs. Mexican Style - Mexican style thatch is known for its water proof durability to protect during the rainy season. Like the Tahitian style, the Mexican style also features a shaggy appearance. Artificial Style - If you love the look of bamboo without wanting the real plant in your home or backyard, you can opt for artificial umbrellas made from a variety of materials and painted to recreate the style of real wood. Cover 7 ft. diameter Palapa covers are ideal for smaller spaces or areas that don’t receive a substantial amount of sunlight. A few placed throughout the yard can add a touch of the resort style living without overcrowding the area. Being in the middle of sizes, 9 ft. diameter Palapa covers are great mid-sized covers for almost any backyard project. You’ll have an umbrella big enough to enjoy the shade it provides without owning a cover that’s too big for your yard. Being the one of the largest options for residential properties, 12 ft. diameter Palapa covers are best placed together in large backyards to create entire sceneries. Why not go all the way? 14 ft. diameter Palapa covers can convert any gazebo into a tiki umbrella, great for themed parties, family gatherings and celebrations, and everyday use.